Weird Pretty Pictures Ltd. is proud to present ‘Sodium Party’, the debut feature film of Irish director Michael McCudden. Set to premiere at the inaugural IndieCork Film Festival in County Cork, Ireland on October 19 at 7pm, Sodium Party is an experimental non-linear thriller set between both modern day and the protagonist’s childhood. Claire (Slaine Kelly) is a girl whose childhood was sheltered by a controlling mother. After the deaths of her parents, she leaves for college and the life she never experienced. A new world opens to her as she meets Danny (James Corscadden), a college student obsessed with photography, who is as taken with Claire as she is with him. He introduces her to a life that she never had, where they go to parties, and experiment with all there is to experiment with. But just as life seems to be going her way, Hannah, an imaginary friend from her childhood, begins to appear and haunt Claire, and her life begins to unravel in front of her eyes as the past refuses to stay in the past. A tale of death and life, rebirth, childhood, control, betrayal, kidnapping and the possible supernatural, Sodium Party breaks down the standard film form to become something truly unique. 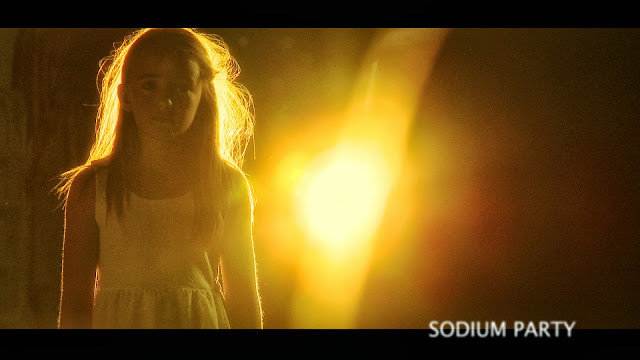 Sodium Party is for audience who enjoy the work of filmmakers such as David Lynch (Mulholland Drive), Richard Kelly (Donnie Darko), or Adrian Lyne (Jacob’s Ladder), as well as those who enjoy an engaging and non-traditional story that will keep them guessing. Audiences will be left stunned and stimulated by the end of the film, unwrapping its many layers. The film is designed to stand up to multiple viewings, with new pieces of the puzzle coming to light on each viewing .The poetic narrative has elements of fantasy or fairy tale. The project’s origins are in random super 8 home movies, whose content force a viewer to layer their own perception onto the images. The story is about the story itself, whose telling becomes part of its direction. Initially an experimental found footage film, it was decided Sodium Party should utilises the beautiful Irish scenery and marry it with a European narrative style. Producer Alison Scarff ushers in a new generation of filmmakers by running the massive production at the young age of 21. With her producing partner Richard Waters (also 21 at the time, and editor of the film), they were responsible for the co-ordination and running of such a major operation for such a limited budget. Following the completion of Sodium Party and owing to a particularly successful working relationship, the two joined star Slaine Kelly as producer and director respectively on the romantic comedy The O’Briens, which went on to win the Outstanding Achievement in Filmmaking award at Newport Beach Film Festival 2013 and is currently set for wide release on DVD.